1. Add the pasta to a large pan of boiling, water and boil gently for 10-12 minutes. Drain. 2. 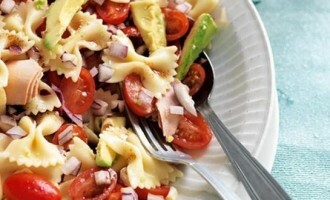 Flake the drained tuna into a bowl and stir in the tomatoes, red onion, avocado and cooled pasta mixing the ingredients gently. 3. Mix together the olive oil, balsamic vinegar and reserved tuna oil. Season and drizzle over the salad. Toss together gently before serving.